Two series regulars bit the dust, one major character was revived, and the Red Devil returned in Scream Queens 2×10, the season 2 finale. 1. Hester’s promise to Brock Holt. From the Chanels skipping down the hallway to Brock proposing, this scene in Scream Queens 2×10 is all-around perfection. It even ends with Cathy excited for the “pounding” that will commence in her final days of life. 3. Brock’s proclamation to Chanel. 4. Dean Munsch’s reaction to Chanel No. 5 invading her private time with Dr. Holt. 6. Chanel’s ridiculous plan to kill Dean Munsch. 7. Smoke on the Water. Speaking of Dean Munsch, her entire awake craniotomy is a total blast of insanity. From Munsch singing Smoke on the Water to Chanel tossing her PSL on Hoffel, this scene in Scream Queens 2×10 is straight-up zany. The montage of Jamie Lee Curtis brushing her teeth with Scotch coupled with the revelation that she is just suffering from dehydration and won’t be dying anytime soon is simultaneously hilarious and ridiculous. The call to Swando in which he calls Munsch a “xenophobic piece of garbage” is just the icing on the cake. 9. Hoffel’s reveal of the bomb. 10. Another gem from Hoffel. 11. Denise asking what she missed. 12. Chanel No. 5 revealing the truth. The red devil returns! Just when it seems like everyone is getting a happy ending, the Red Devil pops up in Chanel’s backseat after leaving a KKT present for her. It seems like all signs are pointing to this Red Devil being Grace, which brings things full circle for the series. 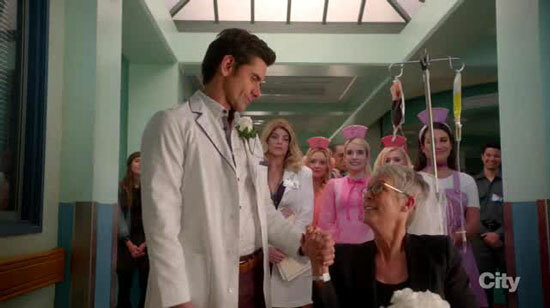 What did you think of Scream Queens 2×10? Are you mourning the loss of Dr. Cassidy Cascade, a.k.a. Taylor Lautner? And who else is praying for a third season? Let’s see a cool Blood Island or TV/movie studio theme next season!